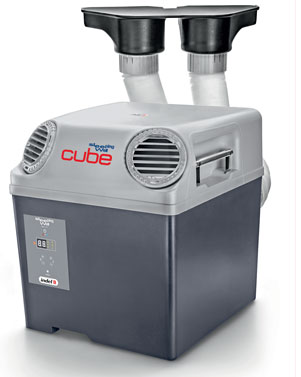 Standalone portable air conditioning unit ideal for truck night-time use. Used mainly to cool the truck cabin at night, during the drivers rest periods, during loading and unloading operations. Does not use roof hatch. Easily moved from vehicle to vehicle. Supplied with unique Cube installation kit, maintains cab security. Ideal for small animal transportation. Can help to dehumidify cab. Auto mode reduces fan and compressor speeds to help keep power consumption low.